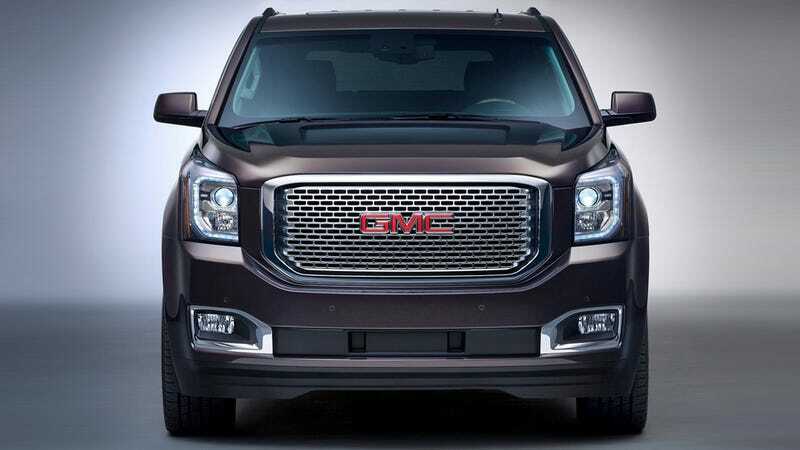 The 2WD 2015 GMC Yukon's new 8L90 8-speed automatic and 3.23:1 rear axle ratio bring its 6.2 V8's best highway economy from 18 to 22 MPG; not bad, and 1 MPG better than the SUV's base 5.3 V8. GM posted similar gains in the other trucks with this power train. That 6.2 EcoTec3 is also available in the Chevy Silverado and GMC Sierra pickups, and featured as standard equipment in the Cadillac Escalade. Output is still 420 horsepower at 5,600 rpm and 460 lb-ft of torque at 4,100 rpm, but fuel economy moved up across the board with the new transmission. The biggest bump was on the 2WD shorter-sized SUVs; the "Chevy Tahoe" scale luxury liners; and the most noticeable jumps were in highway performance across the board. Two extra gears helps get revs down during cruising, and allowed GM to use a numerically lower rear axle ratio to make driving at speed more relaxed. Since GM tuned up their 6.2 engines with active-fuel management (shutting down four cylinders when it could) the extra speeds provide more of an incremental improvement in economy. In fact, the 2WD pickups didn't event move up enough for the EPA to round to the next number. But the 8L90 8-speed should help drivers get the most out of GM's biggest gasoline truck engine. If anyone's driven it yet, we'd love to hear your thoughts!